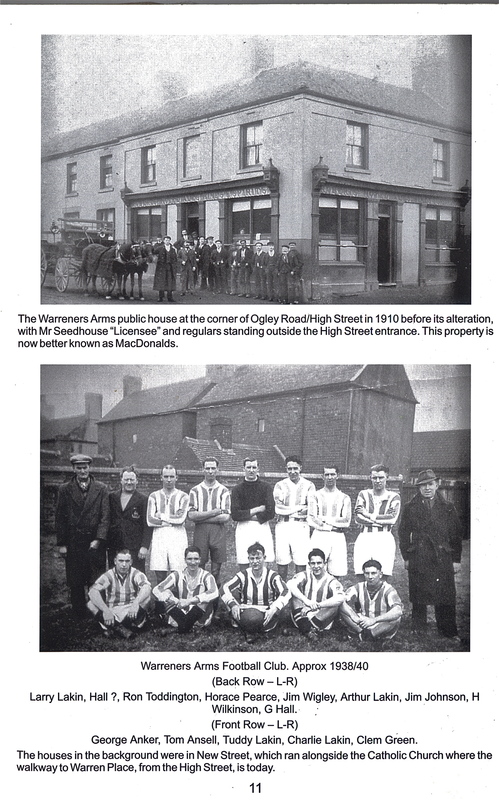 Further to my earlier post about the sad fate of The Warreners Arms, and especially for Stymaster, who correctly recalled a picture of an earlier incarnation of the Warreners in a local history book, I found it. It was in ‘Memories of Brownhills Past’ by Clarice Mayo and Geoff Harrington, and I reproduce both that photo, and one of a group shot of the pub’s football team. Interestingly, the caption states that the picture of the hostelry was ‘…before its alteration…’ – I can see little commonality with the building we know today, so I assume it was demolished and rebuilt. Does anyone out there know for sure? My previous request to either Clarice or Geoff still stands; I’d love to buy a copy of this excellent book but can’t find one anywhere. I’ve trawled eBay and all the usual sources. Please excuse me scanning your work but it’s so wonderfully relevant that I’m sure you’ll understand. If either of you are reading this, please mail me at brownhillsbob at googlemail dot com, or comment on his post. I’d love to chat to you. I’m fully intending to wrap up a whole bunch of local history in the next few days, so please call back if that’s your interest. Page scanned from 'Memories of Brownhills Past' by Clarice Mayo and Geoff Harrington. This entry was posted in Brownhills stuff, Followups, Local History, Shared media and tagged Brownhills, Brownhills local history, Derelict, Local History, Memories of Brownhills Past, Old photos, Pubs, Warreners Arms. Bookmark the permalink. That’s the very picture. I’ve just taken that book back to the library, along with another local history one, so well done for scanning it. It is odd that they use the term ‘alteration’ as it is fairly different to what stands now. Can anyone remember Alf and Pauline who kept the Warreners around 1960? What a character,so funny and a great storyteller.